CALL it a pressing need to meet the growing thirst of the Mumbai metropolitan area or plain negligence, but the Maharashtra government is building a dam in a quake-prone zone. Worse, work is going on without environmental clearance or the consent of people who stand to lose their homesteads, livelihoods and community forest to it. Recently, Bombay High Court sided with the government, rejecting a plea to stay it. 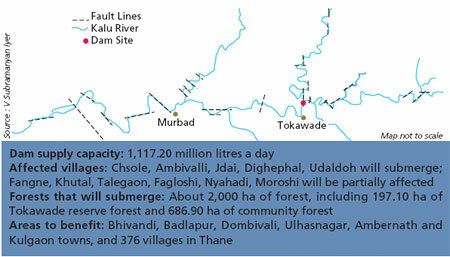 The dam on the Kalu river is coming up in Murbad taluka in Thane district. Built by Konkan Irrigation Development Corporation (KIDC), the dam aims to cater to the needs of six towns and 376 villages in Thane which face a shortfall of about 150 million litres a day. Seismologists and geologists have expressed shock at the selection of the site. V Subramanyan Iyer, retired geologist from IIT Bombay, says there are at least 10 geological faults along the river basin in Thane alone (see map). He was part of a study, conducted in 1997-2002 by IIT Bombay, the Indian Institute of Geomagnetism (IIG) and Bhabha Atomic Research Centre, that mapped the entire Kalu basin. Unlike any other river, for most parts the Kalu flows along straight lines, which suggest geological faults controlling its flow, C D Reddy from IIG says. Four of the faults are active, capable of generating quakes. A fault below a dam is risky, says Iyer, adding that Mumbai falls in the seismic zone 3 where a 6.0 magnitude quake is possible. “A detailed study should have been done,” Iyer says. Agrees Indavi Tulpule of Shramik Mukti Sanghatana, a labour organisation in Murbad, which is spearheading protests against the dam. In the event of a quake, the dam would collapse and wash away villages downstream. Villages on the West, Khapri, Kasgaon, Sakhare, Saralgaon and Titwala, and the Tokawade forest are at high risk, she says. Besides, once built, the dam will submerge five villages and partially displace six others. It will also inundate about 2,000 ha of forestland, including a reserve and a community forest. Gram sabhas of eight villages who own the 680 ha community forest have rejected the project, but to no avail. On June 25, the Shramik Mukti Sanghatana moved the high court urging a stay till the project gets necessary approval. It held Maharashtra’s chief secretary Ratnakar Gaikwad, environment secretary Valsa Nair Singh and Union environment minister Jairam Ramesh responsible for illegally starting the work. The court admitted the petition. On July 26 it rejected the plea after the government counsel said the dam work had not started and the irrigation department was in the process of getting approvals. The court asked the state to submit status details of the approvals in three weeks. Tulpule says the authorities have started work on the project. 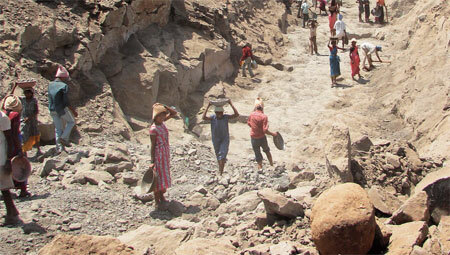 “They have felled over 1,000 trees in Khapri village and are digging trenches,” he alleges. When contacted, KIDC officials said since the project is not meant for irrigation or hydropower, it does not require Centre’s clearance as per the Environmental Impact Assessment Notification, 2006. “The application for forest clearance is pending with the Principal Chief Conservator of Forests,” said a senior KIDC official who did not wish to be named. Sources in the corporation say a powerful lobby is pushing for the dam as meeting the drinking water needs of Mumbai is top priority. The dam is funded by Mumbai Metropolitan Region Development Authority.